Hello, and welcome to my Finds of the Fair from July's Vintage Village. Let me start, as is customary, with a little introduction: my name is Chris - aka Mr Mod Cons - owner of All Mod Cons with my wife. I have been collecting mid-century homeware for about 20 years now and more recently trading in the same, partly as I find it very difficult to pass up a bargain or the chance to save a long unloved item from a very uncertain future. My interest stemmed from my parents, who love 1930s Art Deco, and really came into its own when the 1950s items started to creep out of the woodwork and into antique centres such as the Ginnel Gallery in Manchester. What a place, how I miss it! My own personal favourite style of homeware is 1950s as items of great design can be found, many of which retain some of the pre-war build quality. Fashion-wise it has to be 1960s Mod. I get great satisfaction from using a vintage item on a daily basis in place of a modern item, whether it be a telephone, lamp, clock or whatever. In fact I will avoid buying anything new for the house unless it is absolutely necessary. I can appreciate most decades, to be honest, and the pieces I like are the ones that are instantly recognisable as from a given period. Without further ado it is time to get to my Finds of the Fair. I had such a fab time as I so rarely get chance for an unhurried look around the fair as we are generally standing and I feel bad to leave Mrs Mod Cons for too long holding the fort! So here goes . . .
Because I had to drop off an item with VRK I located their stall next, and when chatting spotted this out of the corner of my eye. 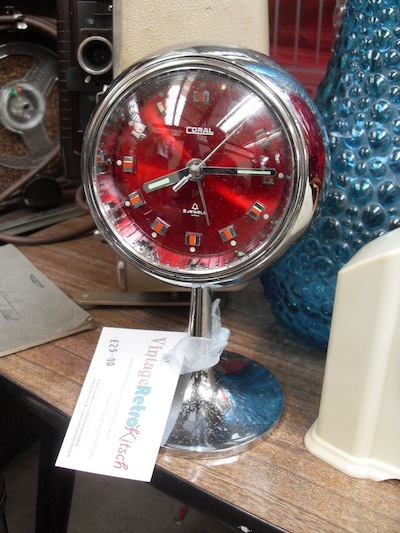 As most of you probably know, I love anything with space age styling and this Coral clock well and truly ticks that box. These are becoming extremely popular now, in particular with the cool retro red face, and I was very tempted to take it home with me but, as I have plenty of similar ones, I had to exercise some restraint. I had seen a picture of these in advance on Strumpet's facebook page so was kind of looking out for them as I was going round the fair. 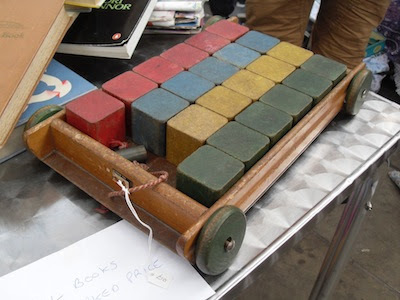 As a child I had a similar set: mine was the push along version with a handle rather than these which had a rope to pull the cart. In fact my dad has a cine film - yes, cine - of me standing up and throwing a block into the air and it landing in the only available slot in the cart! These were therefore a really nice nostalgic item for me at a great keen price. Upon reaching Catherine at Lace & Liquor it wasn't long before I spotted this item, and I don't suppose those of you who know me and my stock will be surprised by the selection! 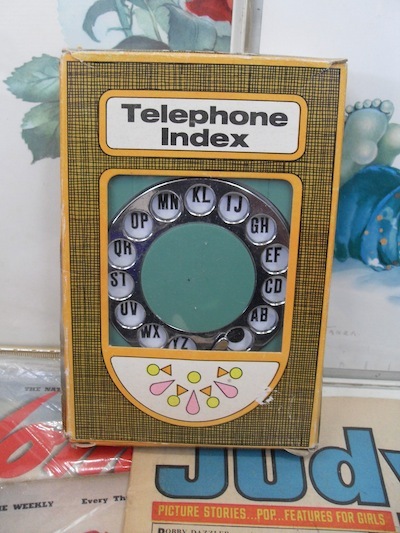 This was in excellent condition, still retaining the original box, and is a really quirky item as the dial on the front actually allows you to go to the card of the desired letter of surname by dialling the number associated. It was no surprise that as I put it down it was snapped up by the person behind me, well you snooze you lose! As I progressed around the fair the next few items were selected using my feminine side! I have bought a few things from The Side Room in the past, and this time the lady explained the origin of her business name. If I remember correctly, in her childhood whenever it was asked where something was the answer always seemed to be "in the side room" - I liked that! 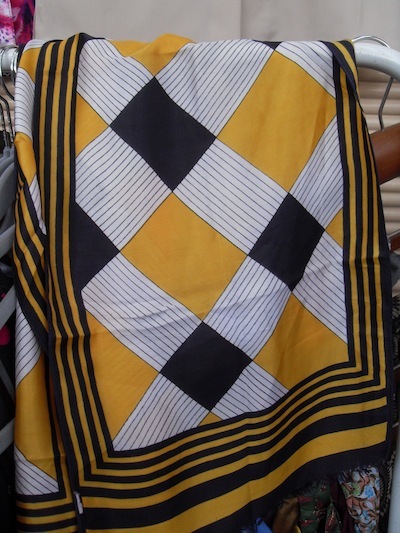 Anyway, Mrs Mod Cons likes vintage scarfs and this one took our eye, being decorated in a nice geometric pattern. I suspect it dates from the 60s, for the price again it was never not coming home with us! 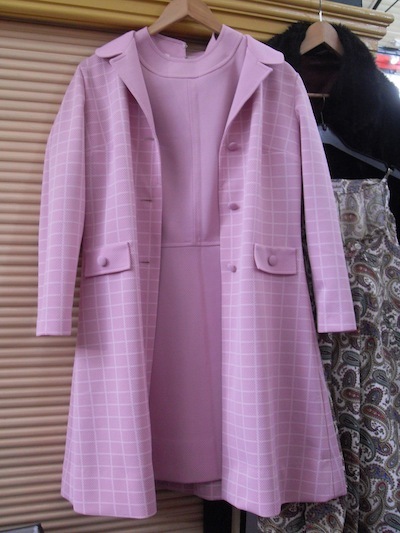 Continuing on my feminine side, this matching dress and coat was the next thing to take my eye. I love 60s fashion for men and woman, although I haven't moved over to vintage clothing myself yet, apart from a number of 60s skinny ties. It should clearly be the logical progression . . . of course I am referring to men's clothing! Anyway, it is the fitted nature that appeals and generally, particularly Mod fashion, it is a very smart tailored look. Surprisingly, the seller didn't seem as taken with the outfit as I thought it justified, but then if we all liked the same things it would be a dull world, eh? As the outfit would neither fit nor suit either of us we had to admire and move on! These super kitsch items caught my eye literally across the room. Although I love my high end mid-century design, stylish and abstract tasteful items, I really think that the world would be very dull without a good bit of kitsch design, and these items really sum up the fun side of 50s design. The 1940s had been such a terrible time for most people during World War Two, with the years following seeing a continuation of material shortages. The 1950s gave way to massive advances in new materials making it easier for quirky objects to be mass produced at low cost - it must have seemed amazing to the consumer. 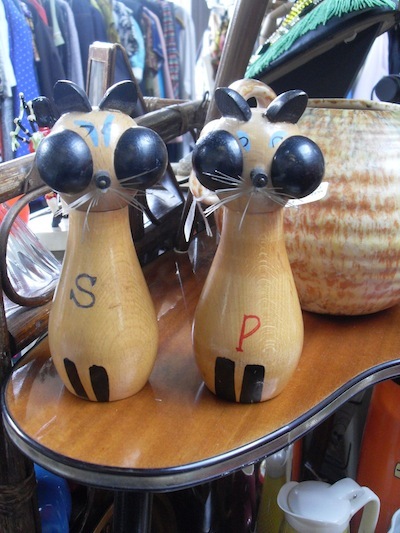 I have quite an extensive collection of salt and pepper pots so this appealed on a few levels - an absolute bargain too! 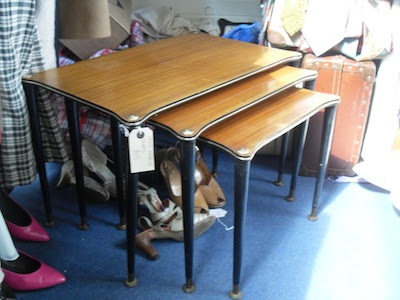 My last find of the day was these fabulous tables, and Kat was on hand to chat to me as I admired them. Instantly recognizable as 50s from their spindly legs with gold tips, this is a style that I love and most of our furniture at home is of a similar style. They are from the more mass-produced end of the market but have a really great style. What appealed even more to me is that they are in need of a little TLC to bring them back to their former glory. I firmly believe that there is nothing wrong with restoring vintage items, to original specification of course, so they look as good as they did back in the day, and it's no surprise that a deal was struck and these came home with me! 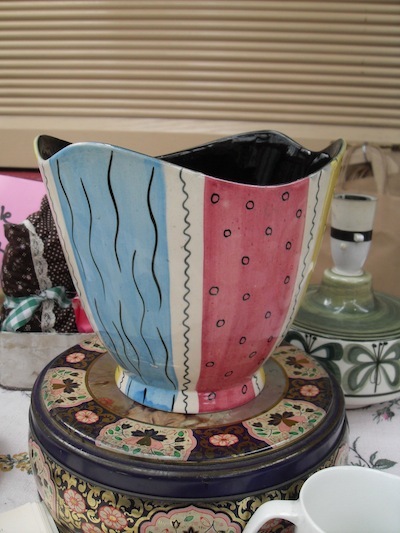 Literally within a few minutes of having entered the fair my eyes were drawn to this lovely ceramic vase on a stall which I had not seen before, in fact positioned next to where we usually stand. Believe it or not, this was put in a bargain basket under the stall. This really spoke to me, having a great mid-century pattern, attractive shape and importantly no damage. When I first started collecting mid-century vintage I was very into ceramics so with this and the price in mind, this vase was never going to be put down again, so I handed over my £2 and moved along very happy! As we worked our way around in the usual unplanned fashion we got to Fiona's stall. Fiona stood next to us at Vintage Village a couple of times last year and always stopped for a chat (and a purchase) at our stall when visiting the fair on other occasions. 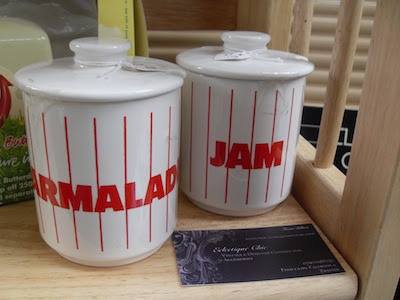 These marmalade and jam pots stood out to me as, in our kitchen at home, we have the matching tea, coffee and sugar canisters, which I love because they are 100% usable in place of something modern. I am a little undecided on the age, and suspect they may just sneak into the 80s but have more than a hint of 50s style. They were in lovely condition and a bargain at the price. 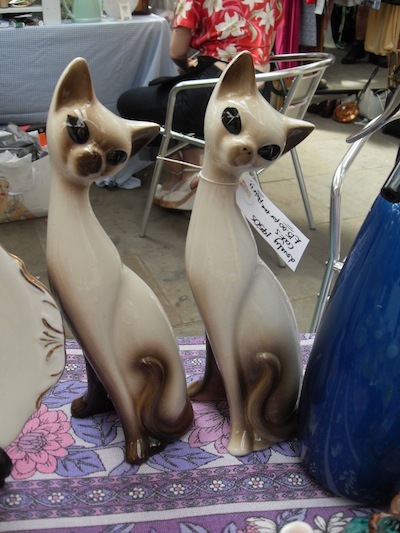 When I reached Rebecca's stall - Tea for Two Vintage - after my usual laugh and chat I spotted these lovely ceramic cats. My mum has a large collection of ceramic cats, the first one bought for her by my dad in the 60s when they were first married, so these always take my eye partly for that and partly as they are an iconic 60s item. Along with a glass fish, I bet a good 75% + of households had one or two of these on the mantlepiece! My next selection is from a stall which I have not seen before, and upon speaking to the stall holder I understand it was their first time standing at The Vintage Village. 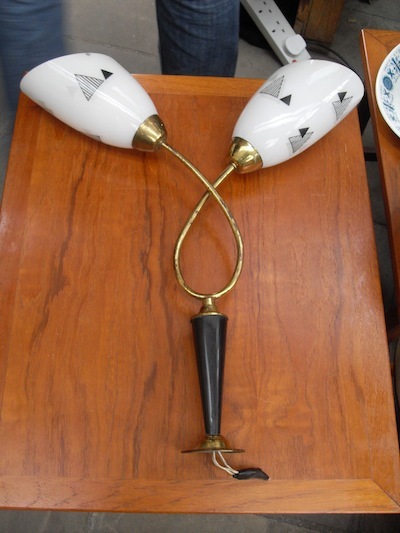 There were lots of cool items from the 50s-70s but this light fitting took my eye. 1950s of course - I love this decade! - and originally a ceiling fitting I think, but I intend to rewire and convert it to a table lamp. I've given it away now! Yes, I bought it, although the seller drove a hard bargain, giving me only £1 price reduction despite my very best attempts! It will keep me busy for a while before being resurrected as a real stunner. As I looped back around the hall we stopped at Lost but Never Forgotten, initially because Mrs Mod Cons knows one of their friends who was helping out. We both spotted this item at virtually the same time and I have to say it is one of my favourite purchases of late. 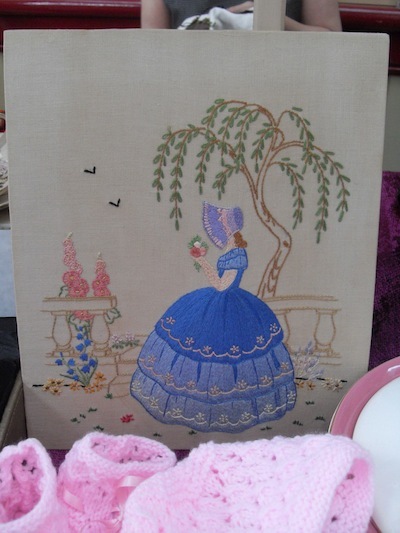 It is hand stitched, of course, depicting a 'crinoline lady' in a very attractive setting reminiscent of Pride and Prejudice or similar. What really sealed the deal on this one - apart from a couple of pounds off the price! - was the fact that it is signed and dated 1946 on the reverse. It shall soon be framed up and hung in baby Mod Cons' bedroom to be enjoyed for many more years. As time was getting on it was time to get over to the Room at The Top Vintage Goods, the fantastic recent venture of Alan and Sarah, organizers of Vintage Village. I started at the far end where Simon of Donald and Miss June was looking ready for a chat! He always has some impressive vintage electronics available and I surprised myself a little with this choice as I had been eyeing up his Weltron Globe 8-track - super space age stuff! 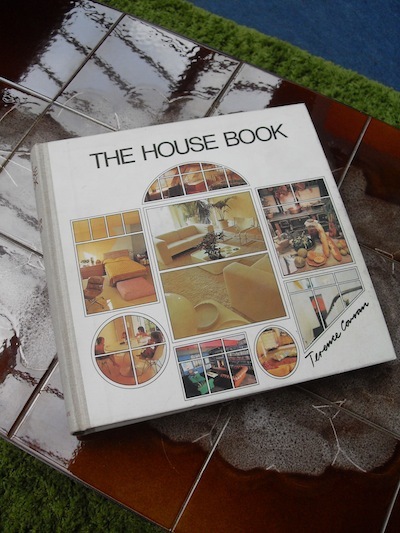 However something caught my eye and it was this first edition of the Terrance Conran House Book. I love reference books but what is even better is period literature (I have some mid 50s Ideal Home books and love them). This book had some superb full colour plates of cutting edge 70s rooms. Had it been from the 50s or 60s it would have been in my bag in a flash . . . after paying of course! I always enjoy a good look around this stall as Jane and Lynne have very similar taste to me, and I soon had a couple of items under consideration. I have always really liked smoking accessories, ironic really as I have never smoked a cig in my life! What it is for me is the style of the items, as smoking was such a fashionable habit before, well, the 90s I guess. The associated items were equally fashionable. 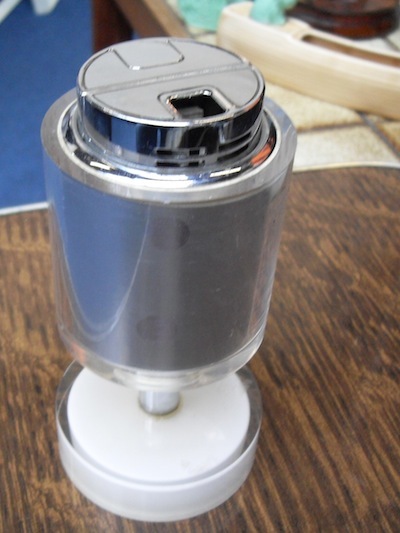 I love the clean lines of this lighter and it is in excellent condition, fully usable just the way I like things to be. It is the logical design progression of the earlier UFO shaped lighters with mushroom bases. I would very much like this in my collection but unfortunately I can't buy everything! Many thanks to Chris for his fantastic selection of prime pieces! Don't miss him when he returns behind his All Mod Cons stall next month at our Fab Gear Fair on Sunday 12th August. You can read Chris' amusing blog about his experiences as a Finder right here. And you simply must visit the All Mod Cons website, Facebook page and follow him on Twitter too!